ike many 20-somethings, Robert F. “Bobby” Kennedy ’51 didn’t know the exact direction his career should take. He knew he wanted a graduate degree. Law or business would work — but he cringed at the thought of it being business. “I think the idea of me at business school has more comical than serious aspects,” he commented in a letter to his sister Patricia. He had written her in reaction to UVA’s blunt assess­ment of his academic performance at Harvard College, from which he would graduate with a bachelor’s degree in political science. He was told he needed to up his game and perform well on his law school aptitude test if he hoped to attend Virginia. In 1948, the Law School indeed welcomed the son of influential businessman and public servant Joseph P. Kennedy Sr. as a member of the first-year class. What the University gained wasn’t just a member of a family with growing political reach, but a young man growing into a person of substance. Kennedy had contributed to his brother John F. Kennedy’s successful campaign efforts for the House of Representatives, and had worked for a period as a stringer for the Boston Post in Europe and the Middle East. But perhaps his most noteworthy accomplishment before UVA was his perseverance as the smallest player on Harvard’s football squad. At 5-foot-9 and weighing about 165 pounds, Kennedy got knocked down frequently, but always got back up again to play. Kennedy’s academic prowess didn’t improve much after admission, however. (His best classes were Constitutional Law and Labor Law.) There were distractions — although ones not entirely foreign to graduate students. He married his wife, Ethel, in 1950. He kept family and social commitments. Papers were sometimes turned in late. He graduated from UVA Law in June 1951 — solidly in the middle of the class. Before he did, though, Bobby Kennedy was able to distinguish himself. As a budding legal advocate, Kennedy’s arguments in his third year as president of the Student Legal Forum helped convince UVA’s leadership to desegregate a major speaking event. The result quietly upended Virginia law of the time and forecast Kennedy as the fighter for social justice that he would become. BECAUSE OF HIS CONNECTIONS, Kennedy was a shoo-in to lead the Student Legal Forum. He was elected in 1950 to serve the 1950-51 school year. A venerated organization at the Law School, the forum invites speakers to comment on topics of the day. High-profile politicians, judges, actors, writers and activists have all delivered remarks at the group’s request. The forum celebrated its 70th anniversary last year, and for all but a brief period in the 1990s and during World War II, has operated continuously. By any measure, the 1951 speaking roster was impressive. In addition to Kennedy’s father, who had served as the nation’s first chairman of the Securities and Exchange Commission and the U.S. ambassador to the United Kingdom, and Kennedy’s brother John, the future president, other speakers would include: Supreme Court Justice William O. Douglas, Sen. Joseph R. McCarthy, RCA President Frank Folsom, former Assistant Attorney General Thurman Arnold, New York Times journalist Arthur Krock — and one other. So we went to the student council and they all thought it was a great idea until it came [time] to sign a resolution saying so. Then many balked. “Hey, why not Ralph Bunche?” Kennedy said to classmate Endicott P. “Cottie” Davison ’51. This was in the spring of 1950 as they discussed potential speakers. Davison recalled his time on the forum in interviews with biographers, including in the book “Bobby Kennedy: The Making of a Folk Hero,” by Lester David and Irene David. Bunche was a well-known public figure. As a mediator for the United Nations, he had successfully negotiated 1948 peace talks between Arabs and Jews in Palestine, subsequently winning the Nobel Peace Prize for his work. He was the first African-American to win the award. Kennedy extended the invitation as a new, more progressive atmosphere at the University was taking hold. That year the Law School accepted its first black student, Gregory Swanson, who was UVA’s first black student as well. But Bunche knew this was still the South. Life for whites and blacks remained largely separate and unequal. He accepted — though he later added the caveat that his policy was never to speak to segregated audiences. That meant Kennedy would have to scramble if he wished to avoid the embarrassment of rescinding the invitation. WHEN THE ADMINISTRATION LEARNED that an openly desegregated, high-profile event for the public was in the works, Dean F. D. G. Ribble ’21 reportedly called Kennedy and Davison into his office. Even so, the dean said he would back the plan if they could get the Student Advisory Council and the Board of Visitors to sign on, according to Davison. UVA Law Professor Gordon Hylton ’77, an expert on the Law School’s history, said if Ribble did insist that Kennedy build consensus among community stakeholders, it may have been for practical reasons. Any signs of unrest on Grounds would reverberate in the media, potentially affecting UVA’s funding from Richmond. Enrollment, boosted by the G.I. Bill after World War II, had since declined by 25 percent. Regardless of the reasons why, Kennedy was annoyed he had to jump through hoops to host such an accomplished speaker, according to classmates. He nevertheless went straight to work. He started with the Student Advisory Council. Others noted that even going home might have been a problem for them, if word got around. 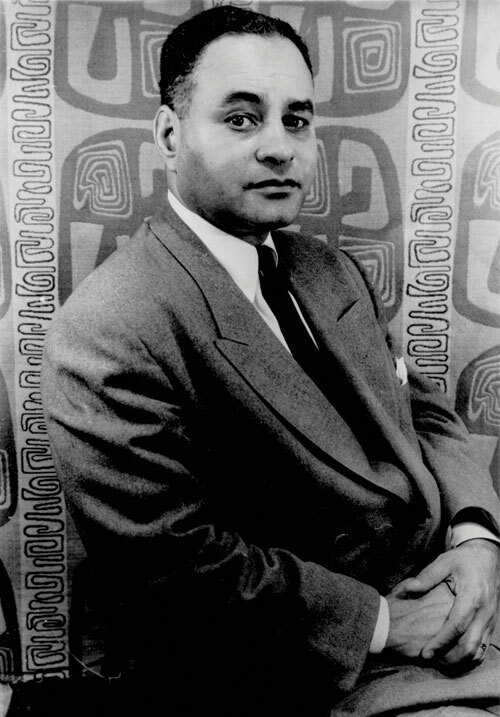 American political scientist and diplomat Ralph Bunche in 1951. WHAT KENNEDY ULTIMATELY GOT from the student council was a compromise. The council apparently provided a statement that said the Bunche invitation had “the overwhelming support of the student body.” Kennedy used those words in his March 8, 1951, letter to President Colgate W. Darden on behalf of the forum (a document now housed in the Albert and Shirley Small Special Collections Library at UVA). But the “attached” resolution Kennedy references, it seems, is lost to time. Regardless of how the council may or may not have gone on record, the student leaders, Davison would later report, promised not to oppose the event — which may have been just as good in the dean’s eyes. In writing his letter, Kennedy knew that it would be fodder for Darden and the Board of Visitors to discuss. The Bunche lecture had been scheduled for the same month. His missive had to be clear and persuasive. The letter was deferential, yet forceful. “At the outset permit us to say that at no time did we consider the invitation one calculated to embarrass the University of Virginia,” Kennedy writes. He goes on to list Bunche’s obvious credentials and prestige, which he says are “hardly necessary to recall,” before mentioning two other recent forum speakers. The first is a “former Ambassador to the Court of St. James”—a not-so-veiled reference to his powerful father. The other is “a Supreme Court Justice,” meaning William O. Douglas; referencing the justice is perhaps a subtle way of invoking the law of the land. 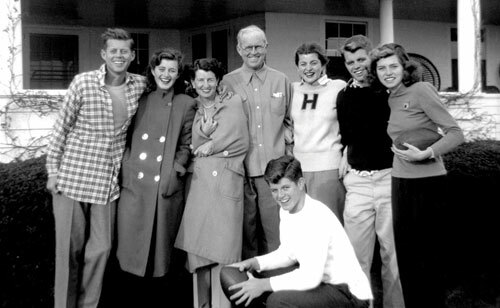 The Kennedy family in Hyannisport, Massachusetts, in 1948: John F. Kennedy, Jean Kennedy, Rose Kennedy, Joseph P. Kennedy Sr., Patricia Kennedy, Robert F. Kennedy ’51, Eunice Kennedy and Edward M. “Ted” Kennedy ’59, kneeling. Kennedy also argues that attendance among blacks would likely be low because the talk fell close to Easter, and that Swanson, the black law student, had already set a precedent by mixing with whites at previous Law School events. After a nod to “the delicate problems posed by the race issue,” he then launches into his legal arguments. “It is axiomatic that the ‘law’ of Virginia is to be interpreted in the light of Supreme Court decisions and it ‘exists’ only insofar as it conforms to those decisions,” Kennedy states. He interprets the 1950 Supreme Court case McLaurin v. Oklahoma State Regents as requiring equal protection for anyone attending a lecture in a state-sponsored educational setting. McLaurin rejected a state law requiring graduate students be educated in segregated fashion. (Kennedy attached a copy — with legal interpretation, for convenience.) In that case, University of Oklahoma student George W. McLaurin sued after being admitted to the school and not being permitted to interact fully with his fellow students. (McLaurin was educated from the hallway, and had his own designated seating areas in the cafeteria and library.) He won under the 14th Amendment. The attached legal interpretation, likely prepared by Law School professors and with Darden’s previous awareness, according to UVA Law historians, also references the companion case, Sweatt v. Painter, which ruled that a state could not deny educational facilities to one race if granted to others. Kennedy may have felt this argument was on shaky ground, however. Writing within the Cold War context, he closes by arguing that denying the mixed seating — in effect, to deny the speaker—would be un-American. KENNEDY PRESENTED BUNCHE as a speaker on the topic of “The United Nations and Prospects for Peace” on March 26, 1951. It was reported that 1,500 people attended Bunche’s lecture that night, which would have meant audience members were elbow-to-elbow in Cabell Hall, a venue that today seats 851. By at least one estimate, a third of the audience was black. “Every seat was filled, and many stood in the aisles and in the rear through the nearly two hours of his talk and the question period that followed,” according to an account in Norfolk’s Journal and Guide. Newspapers largely ignored the controversial seating of the gathering, including in promoting the event, choosing to focus instead on the importance of the speaker and his message. One reason was out of a sense of decorum, with an eye for safety. In a speech noted for its pointed denunciation of isolationism, Bunche’s words were powerful, and called out a U.S. double standard at home versus abroad. “America cannot have two brands of democracy, a pure or first-quality democracy for export and an imperfect factory-second quality for home consumption,” he said in his remarks, which commentators noted and parsed in the days following his speech. The speech was also notable for its opposition stance to the speech Joseph Kennedy made to the forum in the fall, which itself made headlines for its advocacy of the withdrawal of American resources from far-flung lands, including Korea. Bunche, a peacemaker, nevertheless supported active engagement by the U.N. and others to spread democratic ideals and build world citizenship. RATHER THAN THE MESSAGE, it was perhaps simply the moment of peaceful assembly, in which large numbers of blacks and whites sat where they wanted to hear a prominent speaker, that is the lecture’s more enduring legacy. That is not to say that there were no race-related problems, though. Ordinarily, visiting forum speakers would have been hosted for the night at the Farmington Country Club or the Old Ivy Inn, but Bunche was not allowed to stay at either because of his race. He suggested, by letter, that he would depart after the event. In one telling, Bunche stayed with the Kennedys in the home they rented on Cameron Lane. Ethel Kennedy recalled the stay decades later: “They threw things at the house all night,” she is reported as saying in the 2017 biography “Bobby Kennedy: A Raging Spirit,” by Chris Matthews. Kennedy, of course, would go on to become the storied attorney general of the United States 10 years later under his brother’s administration. He continued to serve into the subsequent Lyndon B. Johnson administration after his brother was assassinated. During those four years, Kennedy was an outspoken advocate for civil rights who underscored his efforts with the teeth of the law. That included the desegregation of Virginia’s defiant Prince Edward County public schools. He collaborated on the Civil Rights Act of 1964, which helped bring an end to lingering Jim Crow laws. He was assassinated June 6, 1968, during a run for the presidency. In 2011, sitting Attorney General Eric Holder, the first African- American to hold the position, evoked Kennedy’s legacy in a speech to UVA Law’s graduating class. He did not take any of those easy routes, however.